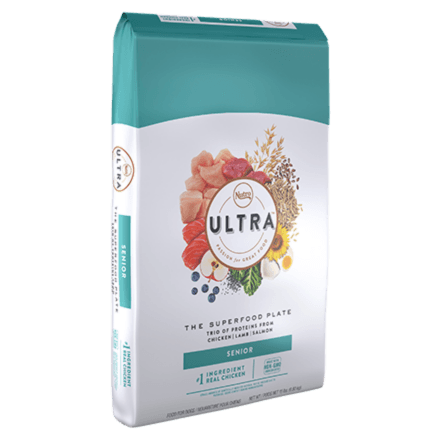 NUTRO ULTRA™ Senior Dog Food is tailored to meet the nutritional needs of mature dogs and to support healthy joints and a strong immune system. Our natural premium dog food is made with nature's finest ingredients and provides complete and balanced nutrition in every bowl. Your dog will enjoy the unforgettable taste of premium, natural ingredients! Chicken, Chicken Meal (source of Glucosamine and Chondroitin Sulfate), Whole Brown Rice, Brewers Rice, Rice Bran, Lamb Meal (source of Glucosamine and Chondroitin Sulfate), Salmon Meal, Whole Grain Oatmeal, Natural Flavour, Dried Plain Beet Pulp, Pea Protein, Chicken Fat (preserved with Mixed Tocopherols), Sunflower Oil (preserved with Mixed Tocopherols), Whole Flaxseed, Fish Oil (preserved with Mixed Tocopherols), Potassium Chloride, Choline Chloride, DL-Methionine, Salt, Mixed Tocopherols and Citric Acid (preservatives), Dried Coconut, Whole Chia Seed, Dried Egg Product, Tomato Pomace, Dried Kale, Dried Pumpkin, Dried Spinach, Dried Blueberries, Dried Apples, Dried Carrots, Zinc Sulfate, Niacin Supplement, Biotin, Vitamin E Supplement, Iron Amino Acid Chelate, D-Calcium Pantothenate, Riboflavin Supplement (Vitamin B2), Selenium Yeast, Vitamin B12 Supplement, Copper Amino Acid Chelate, Pyridoxine Hydrochloride (Vitamin B6), Manganese Amino Acid Chelate, Vitamin A Supplement, Thiamine Mononitrate (Vitamin B1), Vitamin D3 Supplement, Folic Acid, Rosemary Extract. These are the recommended feeding amounts based on ideal body condition for senior dogs of various weights. Individual dogs’ energy requirements might differ. For dogs with low activity levels, feed an amount toward the low end of the range. For dogs with moderate activity levels, feed an amount toward the high end of the range. Adjust the amount fed to obtain or maintain their optimum weight. ‡ Use standard 8 oz. measuring cup which holds 3.21 oz. of NUTRO ULTRA™ Senior food for dogs. Metabolizable energy 3453 kcal/kg, 314 kcal/cup (calculated).